So as Leah was coloring today, she said, "Oh look these are oil pastels." Which promptly stopped me in the midst of working to look over at her. How in the world does she know what oil pastels are? I guess she is paying attention in art class. 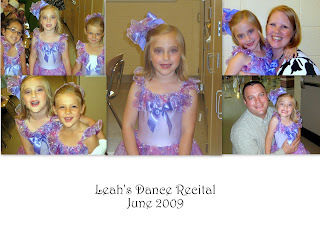 Here are some pictures from Leah's first dance recital. Her class did a tap routine to "I'm a Big Kid Now." Not only did she learn tap, but she also learned ballet and tumbling. 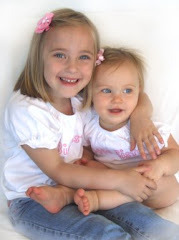 Two of Leah's favorite friends, Ava and Phoebe, were in her class too. It was such a fun year of dance! I'm linking to BooMama's DipTacular! Just in time for the football season. Who doesn't need a few more good dips! Every time I make this dip the bowl is wiped CLEAN. I have yet to see someone lick the bowl but there have been some close calls. I hope you enjoy it! GO BUCKS! 1. Preheat oven to 350°F. Spread refried beans over bottom of Small Oval Baker (or any small baking dish). In a bowl, combine cream cheese, sour cream, taco seasoning mix and garlic pressed with Garlic Press; mix well. 2. Spread cream cheese mixture evenly over refriend beans. Sprinkle cheddar cheese over top of the cream cheese mixture. Bake 15-20 minutes or until cheese is melted. 3. Sprinkle tomato, onions, olives and cilantro over dip. Garnish with additional sour cream, if desired. Serve with Tortilla Chips, if desired.